Why use Caring Gifts for your Corporate Gifts this year? Here's how it works - You call or come in and give us your budget, date to ship, deliver or pickup, ect. Then just wait for the thanks to come in. We do it all and you look great! 23 years in a Main Street location! 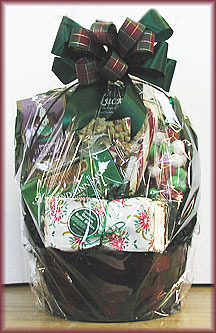 Christmas box of nuts, peppermint bark, double chocolate cocoa, Santa snack mix, chocolates and Christmas pretzels. 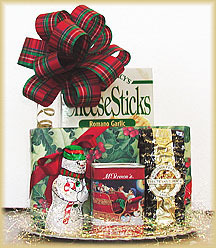 Scrumptious assorted chocolates, cheese sticks, jumbo salted peanuts, Christmas cocoa, and a friendly chocolate snowman. 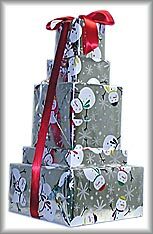 Contains nacho chips & salsa , flavored potato chips, cookies, pretzels, popcorn, foil wrapped chocolate balls, hand dipped chocolates, assorted Christmas candy and peanuts. A great treat for the entire office! Smaller or larger stacks available. WINE - A - BIT! Very festive for any season and one of our best sellers! 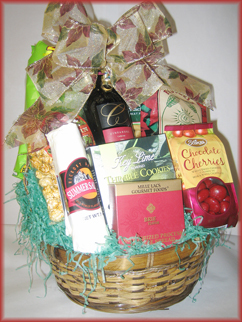 Includes wine, chips, crackers, sausage, chocolate covered cherries, cookies and pretzels.Fun to share with an office. 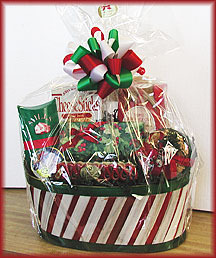 Candy stripe basket loaded with holiday snacks including cheese sticks, triple chocolate chip cookies, mulling spices, our delicious hand dipped chocolates, jumbo salted cashews, ribbon candy and holiday Bon Bons. 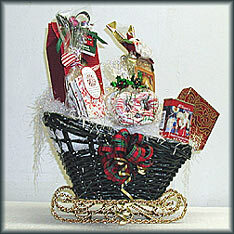 This basket is overflowing with delicious snacks for everyone on your list. It includes popcorn, nuts, chocolate malt balls, cookies, butter stollen and candy cane.